Do you want to keep track of specific word(s) on webpages being viewed in Google Chrome browser? You can easily highlight specific keywords on webpages in Chrome browser for easy tracking. 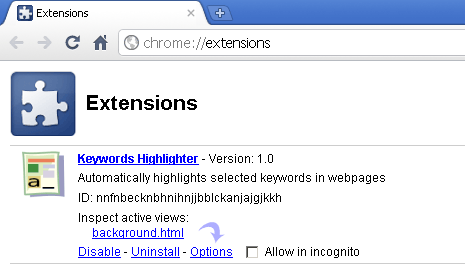 This can be done using manual method of searching or using ‘keywords highlighter’ Chrome extension. 1. 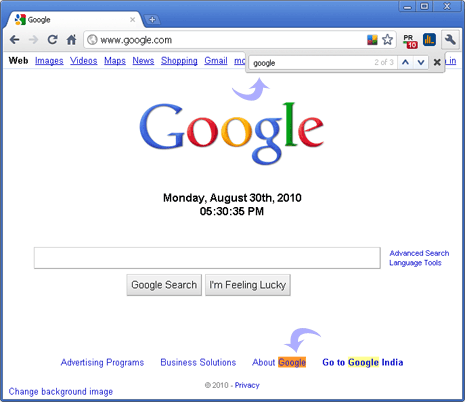 Launch Google Chrome browser and open webpage of your choice. 2. Press Ctrl + F keys to pop search box at top right. 3. Type specific keyword and press Enter key, Chrome will automatically highlight that word on current webpage. For tracking of keywords across multiple webpages, you can use ‘keywords highlighter’ Chrome extension. 1. 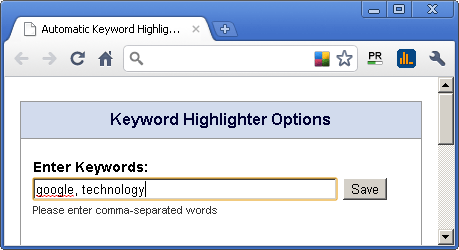 Launch Google Chrome and open keywords highlighter extension page. 2. Click install button to download and start extension installation. 3. Then click wrench icon at top right and goto Tools > Extensions. 4. Click options button under ‘Keywords Highlighter’ listing. 5. In the options box, enter keywords that should be highlighted. From now on, all webpage you open in Chrome will have selected keywords highlighted for easy reference.